Spring is almost here and I have been looking at all the trees, bushes and shrubs outside that really need to be pruned. 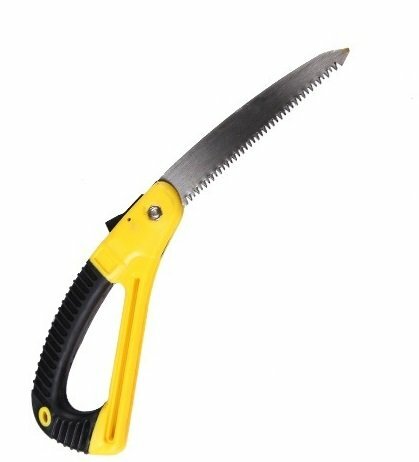 I use my garden shears for the majority of these projects, but there are some that really require a tool such as the Pruning Saw: Careful Gardener Folding Saw with Hand Protection Safety Guard. Easy to Use Tree Trimming Saw to do the job properly. I have used it on a few of the bushes so far and found that it works wonderfully. It worked quickly and easily to help remove some of the dead branches from the winter storms we have had this past couple of months. It is very lightweight yet sturdy, and had no problems cutting through the branches that needed to be trimmed. The handle is designed for safety and it is comfortable to hold on to. It also has a double row of serrated teeth, so it easily cut through everything I tried. I love that it folds for easy storage, and portability. This will be great for future camping trips as well as for emergency preparedness. I would definitely recommend this tool for anyone who has an interest in gardening, landscaping, hunting, camping, or other outdoor activities, as well as anyone who just wants to be prepared for whatever life throws at you. This is a great survival tool, that wouldn't take a lot of space in your bugout bag, car trunk, or other convenient place.